Long before Aspen, Sierra or Life Builders model homes were built, Sam Gates built his cabin at today’s intersection of 2nd Street and Century Dr. in 1852; seated in front of the cabin is his first wife, Lydia Gates. 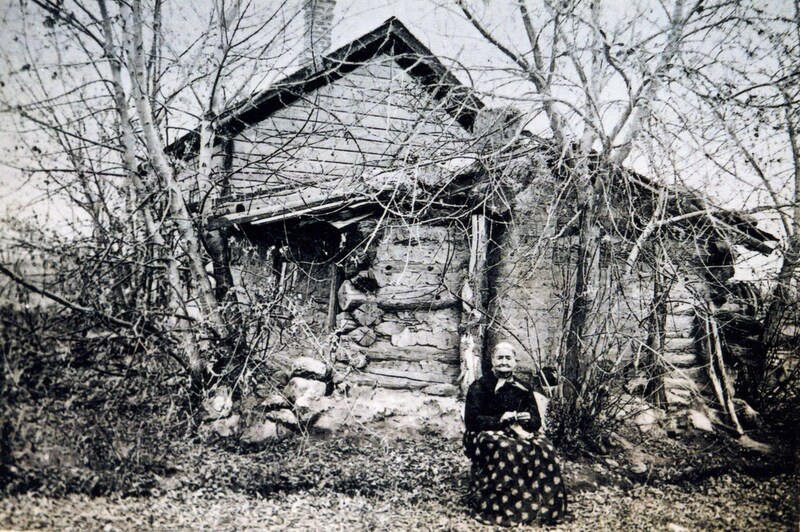 This photo was displayed in the World’s Fair in Chicago in 1893 in the Utah Building as a tribute to Utah pioneers; in 1892 Lydia was living in one of the oldest pioneer houses still occupied; photo by James H. Crockwell 1892, courtesy of Pam Olschewski. 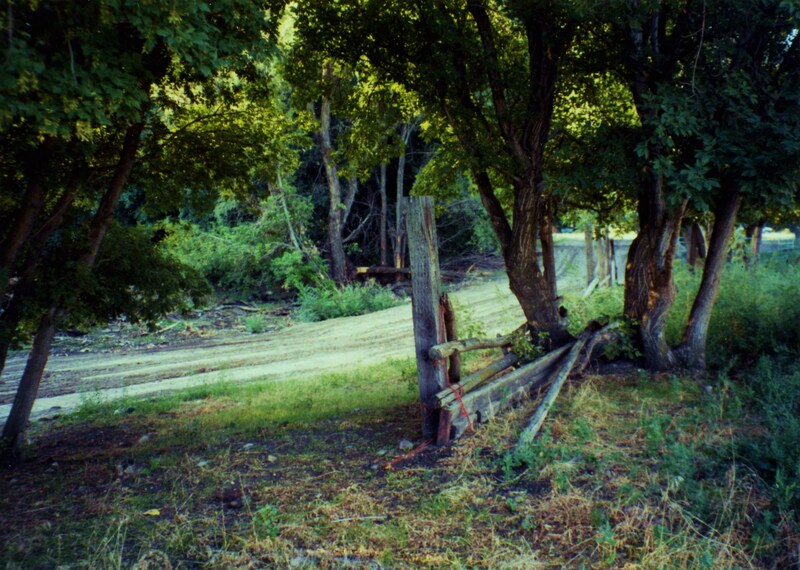 YESTERDAY: The old Sam Gates Lane, looking south to 2nd Street which is visible in background; this lane turned north off 2nd Street next to the Sam Gates cabin and ran 5 blocks to North Street, connecting the adobe mill to the kiln and brick yard; photo 2000. TODAY: Century Drive begins in the same location as the historic Sam Gates Lane; photo 2010. Sam Gates was born in in New York March 14, 1804. He was a stone cutter and an iron foundry man when he married Lydia Downer in 1830 in Lavonia, Michigan, where they lived for eight years before Mormon missionaries came in the vicinity to preach. The course of their life changed when they joined themselves to the Mormon church and moved to LaHarpe, Illinois in April 1842, 23 miles east of Nauvoo. 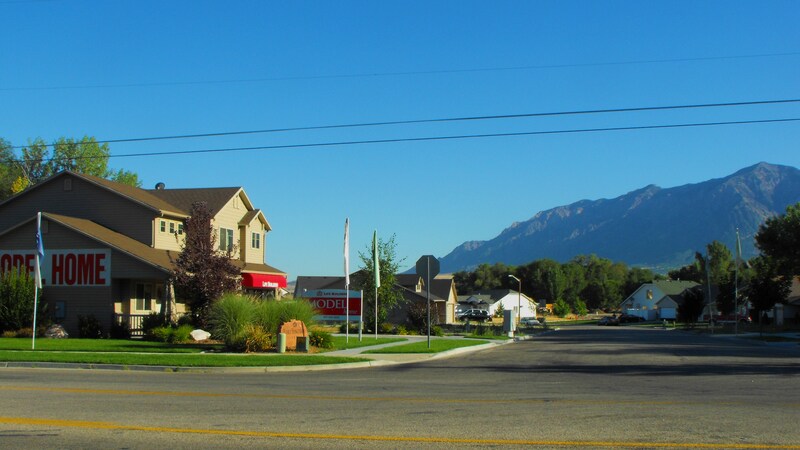 In LaHarpe they became acquainted with the Prophet Joseph Smith and his brother Hyrum who often visited them and stayed in their home. Sam’s Elder’s License* is signed by Joseph Smith. In LaHarpe he also became acquainted with Erastus Bingham and Isaac Newton Goodale (it is possible that he first knew Goodale in Michigan). After the martyrdom of Joseph and Hyrum the Gates family abandoned their farm and moved into Nauvoo where Sam set up an iron foundry. It was an urgent time for the Saints as they worked feverishly to complete the temple while making preparations to abandon the city. Persecution forced an early evacuation of Nauvoo in February 1846. Sam’s foundry was burned by a mob. Afterwards some of the mob approached him and said, “Mr. Gates, we like you, and if you would give up those d…d Mormons, we will set you up in business again.” He refused the offer. Lydia gave birth to their 11th child in Council Bluffs, Iowa, in 1850. They arrived in Salt Lake City in September 1852. In October Sam Gates arrived on 2nd Street. He was greeted by Isaac N. Goodale who wrote in his journal 15 Oct 1852: “went to show S. Gates some land”. Sam was 48 years old and was starting a new home. In 1852 he made a free claim for the 40 acres of farm land opposite the Bingham farm and built his cabin across the lane from the Bingham family cabins. 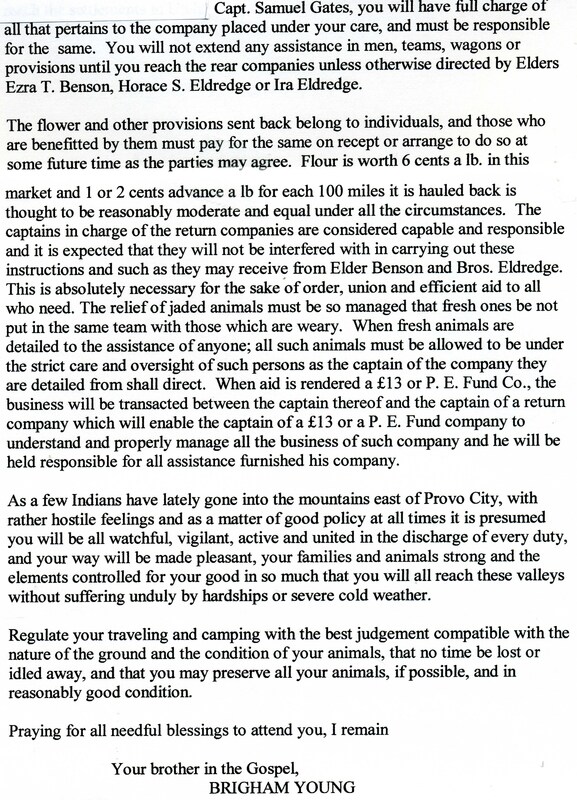 This claim is recorded on the Lemon Survey; it would be his final home. In April 1853 Sam’s daughter Genet married Erastus’ son, Willard Bingham. After building a cabin and beginning his farm, Sam’s first community project was to build a molasses mill on 2nd Street for the sugar cane that the farmers began to grow. The mill was located within the walls of the fort; today’s location of the mill is on Wall Ave. about 150 feet north of the Wall and 2nd Street intersection. In March 1857 Sam and Lydia consecrated all their temporal possessions to The Church of Jesus Christ of Latter-day Saints. 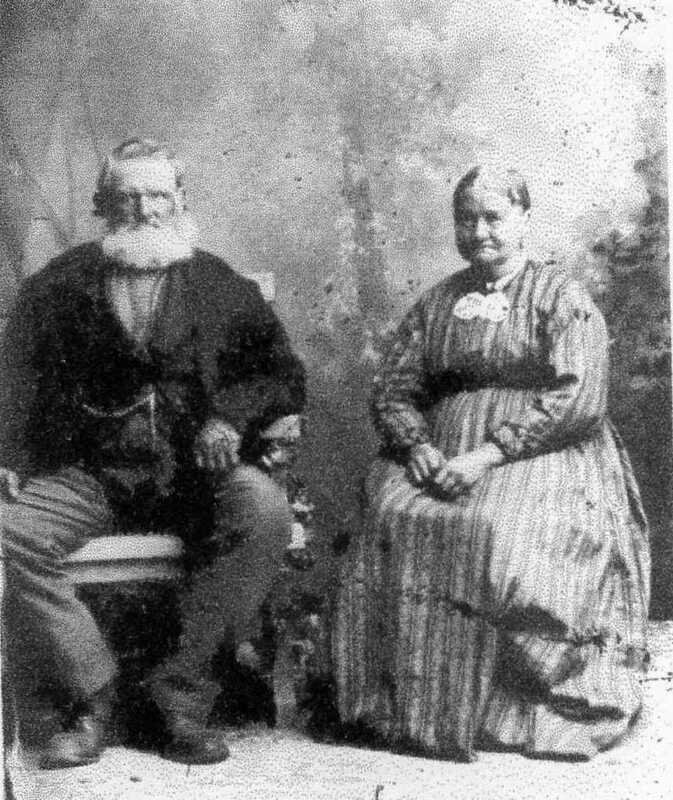 In 1858 Sam was married in polygamy to Martha Waite, an eighteen-year-old lady who had been briefly married and divorced. She lived in another cabin on 2nd St. They had 6 children. 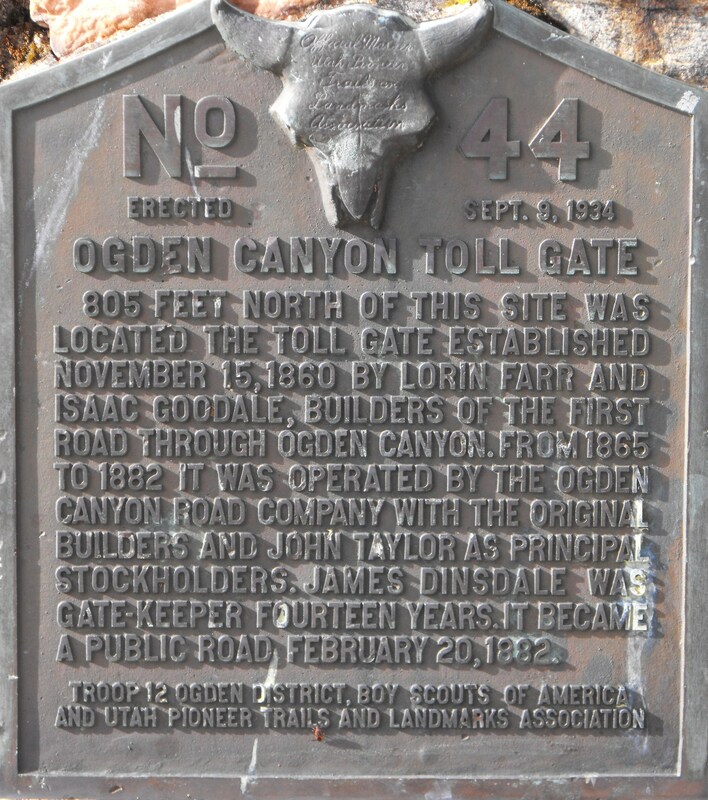 In the 1860s Sam ran the toll gate at the mouth of Ogden Canyon for use of the road to Huntsville. One day while working at the toll gate he found a homeless Danish boy named Peter Sherner and took him home into his large family. 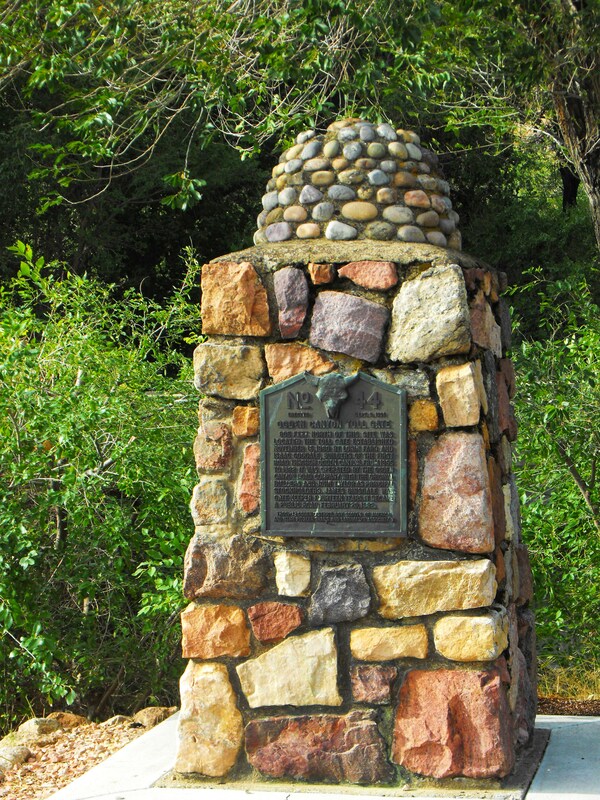 Monument located in N. parking lot of Rainbow Gardens. In 1871 at age 67 Sam built an adobe mill next to his house and in a few years expanded the adobe mill into a brick yard five blocks north of his house. He partnered in this business with his son George and his son-in-law James Gardner. The adobe mill and brick yard were connected by the original Sam Gates’ Lane. Although he sold adobes and bricks and his son George constructed many adobe houses, Sam chose to remain living in his log home until his death in 1877. In 1892 his widow, Lydia, was still living in the log house and was photographed there by photographer Jason Crock. Six structures still remain on 2nd Street in 2018 that were built with adobes or bricks from the Sam Gates’ mill. See footnote for details. After Sam’s death in 1877 his son and son-in-law carried on the adobe and brick business. Sam Gates & Lydia Downer; photo courtesy Pam Olschewski. Samuel Gates loved his wives and his children and was a faithful and devoted husband and father. When he died in August of 1877 he had an 80 acre farm on the north side of 2nd Street. The west 20 acres of his farm was purchased by the James Stone family in the 1870s, and all this acreage remained agriculture for about 150 years until subdivided in 2004. China is one of the most common artifacts found on historic sites. Refined ceramics of the 1830s were made in England and were highly decorative and usually consisted of plates and tea sets. 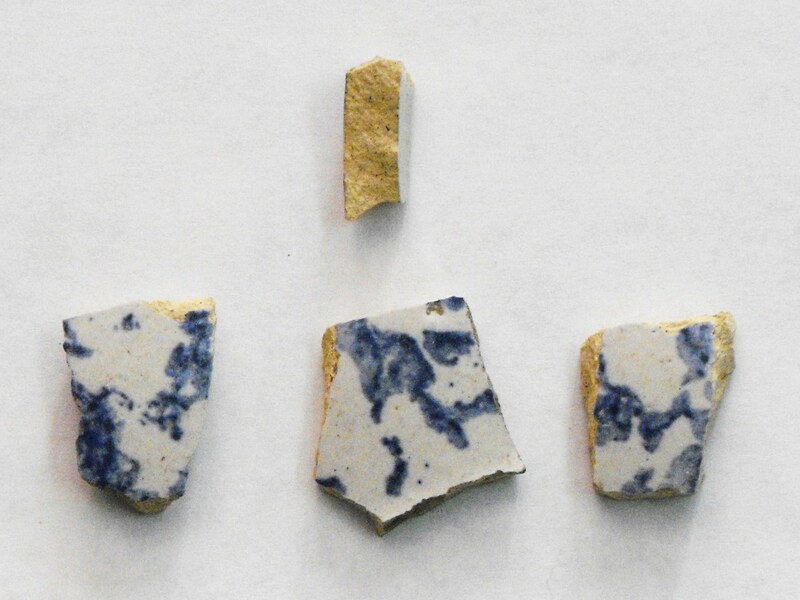 These china chips were found in 2004 at the site of the Sam Gates cabin. 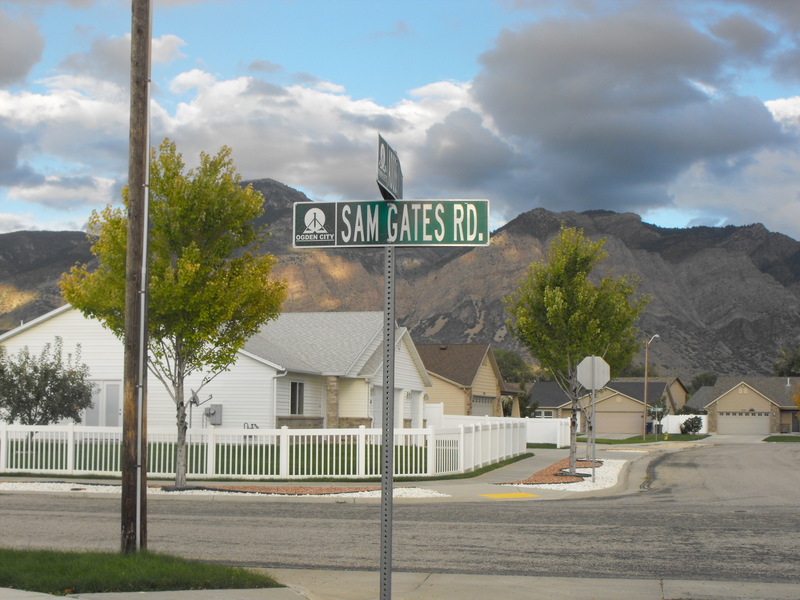 Sam Gates Road is part of the Fort Bingham subdivision; photo 2014. Lisa J. 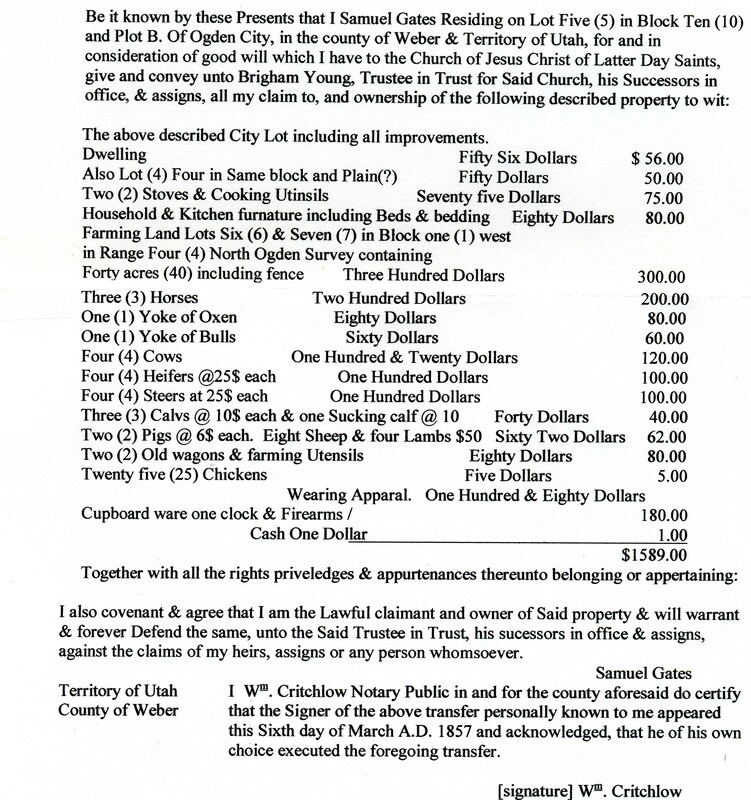 South and Pamela S. Olschewski, Samuel Gates, Jr. and Lydia Downer, manuscript, 2001, p. 1-5. *An Elder’s License – As the Church became more spread out some dishonest men began to take advantage of the situation by going into an area “as an Elder sent by the Prophet to collect tithes and temple donations”. Then the money would disappear. It became necessary to issue a license to elders in good standing to prevent this. Transcribed by Elden J. and Anne S. Watson, The Isaac Newton Goodale Journal 1850-1857, manuscript, 1981, p. 37. South and Olschewski, Samuel Gates, Jr. and Lydia Downer, p. 10, 11. The houses made with adobes or bricks from the Sam Gates Mill are 386 W. 2nd St, 140 W. 2nd St, 122 2nd St, 156 2nd St, 216 2nd St, and the granary at 317 W. 2nd St. This entry was posted on October 2, 2010 at 7:02 pm	and is filed under 7. ROADS IN FORT BINGHAM, i. Sam Gates Road. You can follow any responses to this entry through the RSS 2.0 feed. You can leave a response, or trackback from your own site. I have been researching the Sam Gates family for some time. This is extremely helpful information. Thank you!